Rob Duarte’s REBOOT Laboratory project will be representing the creative research being done at FSU in a first of its kind event at the Smithsonian Institution’s National Museum of American History. The event celebrates creative exploration and research happening at the nexus of science, engineering, arts and design, and is expected to draw an audience of over 40,000 visitors over the three day span. In addition to being a Co-Director at the FSU Facility for Arts Research (FAR), Rob Duarte is director of the REBOOT Laboratory. REBOOT is a studio for art and design that is currently focused on waste plastic as both a material for making and as a focal point for considering the problems of waste and conspicuous consumption. 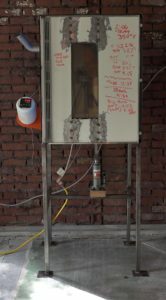 Using the lab’s unique set of DIY tools, visiting artists and designers collaborate with the lab’s director to produce objects that acknowledge and bring to the surface the political and environmental implications of consumer culture, with a goal of provoking discussion and action that will bring about alternative, preferred futures. Duarte and collaborating artists Matt Jeffs and Celeste Ivory, an MFA candidate in the Department of Art, will all be at the event this week in D.C. where they will be exhibiting the lab’s tools, materials, sculptures, designed objects, and works in progress. Duarte will also be part of a panel discussion moderated by Monica Smith, Head of Exhibitions and Interpretation at the Smithsonian’s Lemelson Center for the Study of Invention and Innovation. The panel session will take place during the festival on Sunday October 15 at 3pm.